At first sight, this website looks too plain and outdated. The brown color is not the most appealing choice. But hey; we’re not here to judge the design, although that’s an important aspect of EWritingService.com reviews. We’re mostly here to discuss the quality, support, and value you get at this website. This is an experienced writing service, which has been on the market since 2013. Finally, the day for our unbiased EWritingService review came. We ordered an essay at this website, and we’re ready to share the impressions from our experience. Lack of transparency is one of the most disturbing issues about this website. You cannot see the services they offer unless you sign up. And what if you sign up and you don’t find the type of paper you need? Nothing. You won’t be able to order your paper, but you’ll keep getting promotional email messages from the service. Fortunately, the list of services is versatile enough. It includes academic and business writing services. The academic papers include essay, term paper, coursework, speech, case study, and more. Dissertations and theses are also available. You can also get an application essay here. The website does not provide a clear price chart. When you try to check out the prices, you only get a starting quote per page. Writing starts from $17.56, editing starts from $11.70, and proofreading starts from $9.96 per page. That info is not enough for a student willing to order papers online. You’ll have to complete the first three steps of the order form before you even get to your price. The problem is that the price might not work for you, so you’ll waste all that time for nothing. We decided to order an essay from the education niche, on a topic from early childhood special education. We opted for double-spaced pages, and we got College Senior level. Plus, we chose a native writer (the options are Native, Fluent, and Best available). And we still didn’t get the price! The third stage prompts you to provide paper details, such as deadline and number of sources. We chose a deadline of ten days. Finally, we got a price per page. It was $29.28. For a simple essay with a deadline of 10 days, almost $30 per page is an incredibly expensive price to pay. Still, we ordered that paper because we wanted to provide a review for you guys. For this price, we expected extraordinary results. The paper we received was good. The writer paid attention to all instructions and delivered a clear, memorable essay. Was this worth the price? We’ve seen other services providing the same level of quality for a much more affordable price. 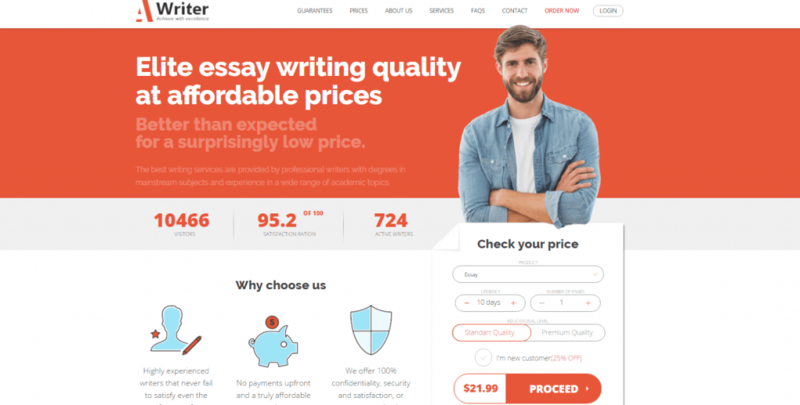 Getting a EWritingService.com discount code would make us feel better, but this website doesn’t even give you discounts. EWritingSerivce delivers great academic work. However, the price is much more expensive than what we’re used to paying for the same level of quality. It’s a reliable service, but it’s not that affordable.